Two interviews in (almost) 1 week! Well I can’t promise to keep up this pace, but I’ve had unusual luck with two great bonsai artists taking a few moments to answer a few questions about all that they do. I’ve mentioned Owen on more than a few occasions, but for those of you that aren’t already familiar I’ll list a short bio below. “The past 12 years of my life have revolved around the culture of plants. My degree in Horticulture at UGA, 5 years of wholesale nursery management, and two years of formal study in Japan at Kouka-en under Keiichi Fujikawa, has culminated in the founding of Bonsai Unearthed in Nashville, TN. Me: How did you get started with bonsai? Owen: A classmate in the Horticulture program at The University of Georgia showed me a Kokufu-ten book one day and I was really impressed by the blend of artistry and science. I was bitten by the bug then and there and quickly purchased, styled, repotted, and killed my first “box store” juniper. With this came my first lesson; don’t push your plants too far too fast. Each failure or mistake I’ve made has been an opportunity to learn. My priorities for learning about plants gradually shifted more and more to species often used for bonsai and I never thought about a given plant purely in the context of utility in a garden setting ever again. “Would that leaf reduce?”or “how well does that one respond to root pruning?” became common thoughts. I had of course seen the Karate Kid movies and already had an interest in Japanese gardens for a few years. Me: How did you decide/ how did you come to the opportunity of working with bonsai in Japan? Owen: My decision to study bonsai formally in Japan was not made quickly. It was at first a pipe-dream that slowly gained momentum as I met more and more bonsai professionals and hobbyists. While doing an internship at Iseli Nursery in Oregon, I was allowed to work with Joe Harris. My conversations with him gave me my first insight into what apprenticeship truly meant and the level of commitment required. After graduation, I chose to work for a wholesale grower / broker in Nashville, TN. My five years there allowed me the opportunity to continue my study of propagation, production, and plant health care on a wide variety of species ranging from annuals to 30 foot tall Japanese maples. During all that time at Samara Farms, I learned a ton and accomplished a lot, but the corner of the nursery with all my bonsai in it always called my name. Having met Bjorn Bjorholm only in passing a few times, I asked for his help in the matter of introduction to Mr. Fujikawa and the logistics of visiting a number of bonsai gardens in Japan. So, I saved up for a trip to Japan, visited a number of bonsai gardens, and asked anyone who spoke English where I would learn the most and get to work on trees. The overwhelming consensus was that my sensei, Fujikawa-san would be the best person to try and apprentice under. Bjorn did a “background check” of sorts on me and took the risk of vouching for me to my sensei; something I still thank him for from time to time. Upon my visit to the Taikan-ten in 2009, my week of garden tours quickly turned into most of the week spent at the Kouka-en vendor area and a trip to visit Kouka-en. I also assisted with take-down and clean-up the next day. It all seemed to “click” well. My first impression of Kouka-en was that of quality and diversify in both species and styles. Me: How has your experience been working with Fujikawa-san? Owen: My experience in Japan has perhaps not been what many foreign apprentices have reported. In some ways yes, I endured countless hours of monotonous work pulling weeds and taking the blame for stuff I didn’t even know about, but I was also given opportunities quite early on to work on bonsai that warranted serious respect. Every bonsai garden has a different approach to apprenticeship and I would further assert each apprenticeship path is a “customized” one based on personality, character faults, and goals of the individual. I would say I have truly enjoyed my time at Kouka-en. Hard work and submission are a given; it’s what you do above and beyond that which really pays off for an apprentice. Fujikawa-san realized I wanted this life 100% and pushed me (generally in the disciplines I was weakest in) to make me a better person and bonsai professional. My eye for aesthetics is opened a lot wider than before. This is also due to my time spent with my Sempai Naoki Maeoka and my days off spent visiting museums, temples, shrines, and historic sites. Most of the important events in Japanese history occurred in the Kansai region, so I’d have been a fool not to search out these sites. So, productive and meaningful. My time there so far has given me a feeling towards bonsai sort of like being able to walk around a garden and know all the Latin names. I’m not a bonsai master and feel the term is abused like Notre Dame in the BCS Bowl. Me: I think I speak for the whole bonsai community in saying that I love The Art of Bonsai Video series. How was your experience working on it, and are there more to come? Owen: First I’d like to say that The Bonsai Art of Japan Series was the brain-child of Bjorn Bjorholm. When he showed me the first episode or two, after editing but before release, I looked him dead in the eye and said “These are excellent” followed shortly by “How can I help!?!”. My part in the project mainly consisted of brainstorming, constructive criticism, some filming, moral support, music suggestions, and lots of jokes. He spends the 15 plus hours of editing per episode that make them so great. We shot those episodes on our lunch breaks and until only recently, the camera disappeared when our sensei rounded the corner. When Fujikawa-san was practically swarmed at Rendezvous last year with comments about the YouTube series, he began to appreciate the project much more. We work hard to take a bit of the pretense out of bonsai plus fill in some of the “middle level information” so hard to find in beginner books. I’m serious as a heart-attack when it comes to teaching, but the video series is both educational and entertaining. Apprenticeship is by no means a vacation and we don’t karate chop branches or stage fight scenes with clients or our Oyakata around. Many episodes simply introduce concepts and techniques. It is then up to the club and individual alike to enlist the help of qualified bonsai professionals to reinforce concepts, advise on when a given technique should / should not be applied, etc. Bottom line, it is a fun project to help on and I learned a lot. I’ve even watched a few episodes to refresh my memory on a technique before. More episodes were filmed before I returned to America in December 2012 so they should come out soon. I look forward to their release too. Bjorn is not one to sit around so the series should continue on. The newest Fujikawa Intl. School Student, David Moreno Martinez should make more appearances now that I’m State-side. He has a lot to offer the world of bonsai and I look forward to his contributions to the Blogosphere. I will leak there’s a music video and another parody episode in the works…. Me: What comes next with your career in bonsai? Do you plan on returning to the states and opening your own nursery? Owen: I’ve returned to America for 2013 to start my business (Bonsai Unearthed) and to take care of some responsibilities I have here in the States. I will return to Japan in the near future to continue my studies at Kouka-en and will one day be certified by the Nippon Bonsai Association; an honor not only for me but perhaps more so to honor Fujikawa-san. My nursery is under construction now in Nashville, TN. For 2013, my priority is to get to know the bonsai community in America and form long-term relationships with yamadori collectors, ceramic artists, etc. Me: I noticed you’ll be teaching this summer at the Brussel’s Bonsai Rendezvous, are there any other “tour dates” you have planned in the coming year? Owen: Definitely looking forward to Rendezvous as I get to meet Marc Noelanders and so many other people in the bonsai community there. His show is one of the best in the world. I will be traveling everywhere from South Dakota to South Beach. My schedule so far has confirmed stops all over, and I will go anywhere that is not currently having a civil war or natural disaster. Well, if the yamadori is nice there I still may go…. I’ve had invitations to teach internationally but these things take time to set up. Looking forward to crossing paths with bonsai professionals everywhere to share what I’ve learned and learn from them. Me: Will there be any particular topics of focus for your teaching in the U.S.? Perhaps subjects that you feel the American bonsai culture is weak on? Owen: The American bonsai culture is very hard to put in a box in my opinion. We live in a massive county and different regions have their strengths and weaknesses as do individuals. My number one priority is to increase the enjoyment, understanding, and appreciation levels of this art wherever I go. I’ve returned at a time when people such as Micheal Hagedorn, Ryan Neil, David Easterbrook, Peter Warren, (to name a few) have criss-crossed America and Canada promoting quality on every level from the container choices, stand selection, display element harmony, kusamono choice, etc. My goals are the same and it’s no coincidence the messages we convey sound very similar. My focus is on gradually increasing a portion of my time and energy in pursuit of world-class deciduous bonsai in respect to collection, creation, and refinement. Another goal I have is promotion of creation, appreciation, and care of kusamono. Mainly in relation to bonsai display, but also as stand-alone art. Me: What is the most challenging thing you’ve had to do during your apprenticeship? Owen: Without question acceptance of where I stand in relation to my ability level. This has a ripple effect spreading to your daily attitude, ability to accept criticism, and in a positive way where you can go from here. When you spend a few years working on the best bonsai on the planet, it quickly becomes evident what is possible and what you are currently capable of. At the risk of sounding like a Zen abbot, I suppose the best way to put it is to accept defeat before starting the battle. The marathon-like consistency of work is mentally numbing. Add that to the necessity of being on point with your memory and proper responses in Japanese and you’ve got one tired foreign watering robot. Me: What was the most rewarding experience you’ve had so far? Owen: Getting a nod and walk-off after a restyle of a bonsai. Lack of changes or criticism is THE holy grail of bonsai apprenticeship to me. It means I did everything right in the eyes of a world class bonsai professional. Another equally sublime moment occurred when a bonsai patron (for about 50 years) of Kouka-en walked by and said my work looked good. Usual comments included sighs, head shaking accompanied by scoff, etc. Many bonsai patrons in Japan may not be able to style trees well, but their eyes for aesthetics and quality are unmatched. Me: What is your favorite species? Either to work with or just to view? Owen: Difficult to say. I really like everything about Prunus mume, Pinus densiflora, Acer palmatum, Taxus, Chamaecyparis obtusa, Juniperus rigida, Acer rubrum, and Taxodium. Any species known for flowering / fruiting really. When you say “bonsai” I think bunjin ume not big pine or juniper. As for viewing, I appreciate displays that are not geared toward overt displays of power. For example, a massive trunk trident maple shaped like a pyramid with heavy flowering hosta kusamono doesn’t really turn my crank. A lonely red pine slant style with a simple moss kusamono does. I see a lot more power of a different form in that. Bonsai display to me should be more suggestive and less literal. We don’t have to put the baby pandas playing in the bamboo display; we have our imaginations for that. Me: Is there a species you dislike? Owen: I don’t dislike any species. I don’t particularly enjoy some aspects of black pine maintenance though. I also do not like being responsible for the watering of 100+ expensive Shohin or carrying a priceless 4 foot wide bonsai down a 3 foot wide aisle. There is something to be said for appreciation of a species or style that is not my cup of tea. Many cultivars of plants grow slowly or present difficulties when working to achieve a style, so understanding the technical ability and time that went into some bonsai can make them impressive if you know what to look for. Me: Is there something or maybe a few things that you think people in general have the wrong instruction on? Owen: Again, big county and lots of regional and local differences. I’ve heard about and seen some local groups that have gotten locked into some bad techniques or cultural practices. This can pose a problem. I see an overall lack of final prep work on trees in bonsai exhibitions though. For example, that extra time spent detail wiring, mossing the soil surface, removing dead or damaged foliage, etc makes a big difference to the feel of a show. Me: Are there any particularly helpful techniques that you think most people in the U.S. don’t practice, but would be especially beneficial? Owen:Good watering practices for some could be improved. There is technique involved in watering and I feel more people should shadow seasoned members or pros to learn the finer points. Follow-through on the details can always be improved. I feel a better balance between a given tree’s aesthetic / monetary value and the quality of container chosen is an area most people including me can improve upon. Me: I’ve noticed on your blog and in various videos that you’re really into Kusamono. What drew you to Kusamono? Owen: My interest in Kusamono stems from a general interest in plants. Kusamono is also an art form with a great deal of potential for expression and conveyance of the artists’ message in a display. A black pine group with a Pyrossia kusamono says “forest” or “valley” while that same group with marsh reed says “ocean side”. You get the idea. Also, making and caring for kusamono gives me the opportunity to work with many of the plants I used to propagate and produce in the past. American native plants are utilized for kusamono to some extent, but should be used more. Well chosen and well grown kusamono can be just as important to a quality display as any other display element. 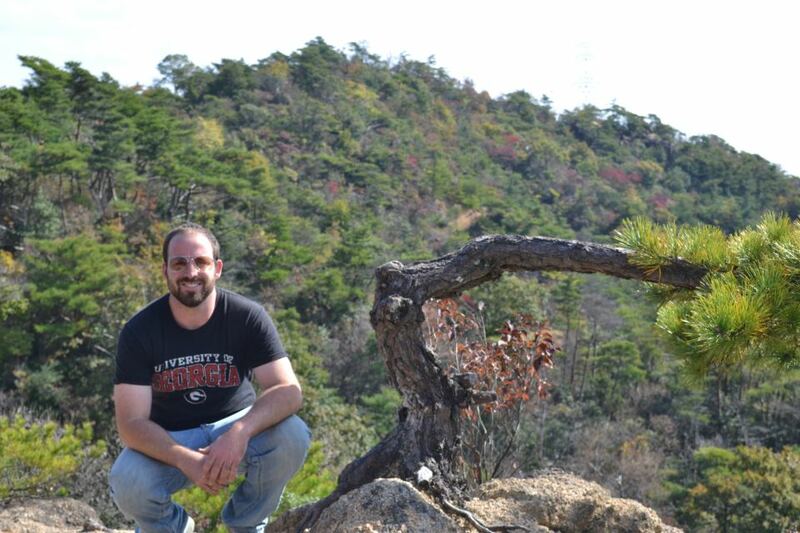 I’m also a big fan of hiking and I see natural combinations in both Japan and America constantly. Tony Tickle and Young Choe (a Japan trained and excellent kusamono artist) have some great examples on their blog and Facebook page respectively. My interest in kusamono may have also come from having gardening withdrawals while living in a Japanese shoebox apartment. Me: Is there anything about yourself or bonsai in general we haven’t touched on that you’d like to talk about? Owen: Support your local bonsai related businesses. If they don’t make or have what you want, tell them what you want. If your local club is not up to snuff, do something proactive to make it better. I feel a great deal of potential energy in the room at bonsai exhibitions and workshops here in America. If you do not travel to other organizations’ functions in your region, consider doing so this year. While you’re at it bring a few bonsai displays and friends with you. If you have out-of-town visitors to your organization’s show, thank them for coming. Their love for the art is apparent through road trips, hotel bills, and vacation days….. As I step off the soap box, thanks for the opportunity to share my experiences and feelings on apprenticeship and bonsai. Thank you again Owen for the thought put into those great responses! Owen’s blog can and should be accessed here. Owen will be making his way around the country so make sure to check in with your local bonsai groups to see if he may be near you in the future. This entry was posted in Artist Spotlight, Uncategorized. Bookmark the permalink. Another cool interview! We have some definite talent coming back to the states. Great interview with Owen Reich over on Bonsai Prelude. Check it out. Another great artist interview from Bonsai Prelude! We have a very bright future ahead of us in the art of bonsai with all of the talent already here.. and coming back to the states.